This is probably my daughters’ favorite craft project this week. It took a little digging up some instructions online, but we finally figured out how to make the corn husk dolls. First you’ll need a pack of corn husks. (I got mine at Walmart.) You’ll need to soak these in warm water for a couple of minutes to soften them up first. Your next step is to stack two husks one on top of the other, then fold them in half together (slightly rolling). Take your twine, string, or yarn, and tie off the top inch or so. Find where the two corn husks separate, spread them apart and flip them both backward over the top portion you just tied off. Now tie this off again, about 2 inches or so to form the head of the doll. Now for the arms, take another husk (soaked) and roll it up. Separate the two husks (at the body of the doll) and slip in your rolled husk (for the arms). Take a piece of twine or string and tie off the body section right underneath the arms to secure.. If you want a boy doll, cut a slit in the middle and separate, binding the two separate pieces with string for the pants look. You can also add yarn to to the head for hair if you like. This was our final result (without the hair). And here’s a quick bonus video showing my daughter making the doll. Let me know how your corn husk dolls turn out if you try this activity! 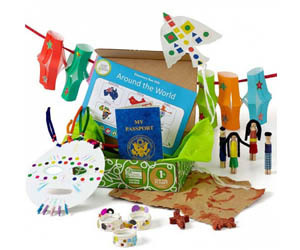 If your kids love crafts, check out Green Kids Crafts for more hands-on fun!